You should consider using business card Nigeria (business card in Nigeria) as a marketing tool to enhance your business. According to Joe Girald, who is regarded by Guinness book as the world’s greatest salesman, "Effective use of business cards – which means carrying bunches of them all the time and giving them out everywhere – is one of the cheapest business building tools you have." With the present economy recession, your business needs every bit of marketing strength to survive. Business card Nigeria (business card in Nigeria) is one form of advert affordable to all small business entrepreneurs. If you are not using it in your business, you are leaving lots of money on the table. A business card is a valuable marketing tool to attract potential clients to your business. It's an effective tool to network at association meetings and with people you meet in your daily activities. It's an essential business tool to share information about your product(s) and service(s). That way you enhance your professional image and company. Apart from using it to promote your business, you can use it as an appointment reminder. Customers' business card can be use as a database for your business. With your business card, you only have one chance to create an impression about your company. So make sure your business card looks visually appealing. It must be professionally designed and the messages clearly conveyed. For the size of your card, I recommend the usual traditional size 3.5 inches by 2 inches. This size is portable and will fit into card holders and most purses. It's vital that the colour swing along with your profession and business. Remember that the quality of the paper is important. The content of the card should convey clearly what you do and the benefit your business offers. The words should be short, effective and appealing to your market audience. Your business card Nigeria (business card in Nigeria) should provide several contact options that people can reach you. Examples are office address, phone numbers and email address. 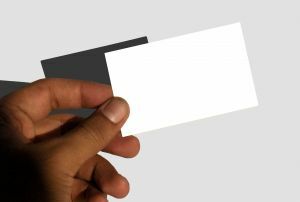 The first impression of your business card will determine whether people will keep it or get it thrown in the storage bin. With a quality business card, your business image stands out from the crowd. You get great feedback from your target audience and attract more clients to your business. Bottom line is to apply aggressive business card marketing to achieve results. You must take it along wherever you go and hand them out when possible. Remember that anytime you give away your business card, you are building your business. Click here to join the Kedi Health Products/Business Opportunity.